Django's guitar style influenced by accordionists? Some time ago it struck me that elements of Django's guitar style maybe developed from the accordionists he accompanied in the bals-musette, in particular the rapid arpeggios and the nature of much of the ornamentation, which seem to me to be more accordion- than guitar-flavoured in the first instance, and that he was maybe "transcribing" such elements to the guitar in developing the style known today as Gypsy Jazz. Prior to the 1990s it was also rare to find accordionists as part of at least the more well known GJ groups, however today they seem to be quite prevalent so it is more easy to appreciate potential crossover elements. I'll give you some good references tomorrow, I'm away from home right now. I think it is difficult to pinpoint one influence over the other ones as some people tried to do in the discussion indicated by Scott. It would mean that we can isolate with 100% accuracy the music to which Django was exposed at a certain point. But I think we can all agree that being involved in a band or a genre for an extended period of time will alter our own playing. Moreover we know that Django was not playing with the accordionists just for money, he was experimenting and adding interesting things to the accompaniment that made him stand out among the other guitarists. So it means he had his ears wide open and most likely picked up ideas from the accordion players. I'd forgotten how well this subject was covered in books and journals in the 80s and 90s. I guess it's not such a surprise, because in those days there were quite a few good bands working in France who were playing the "Manouche-Partie" style of music and guitarists like Francis Moerman, Patrick Saussois and Didier Roussin who were actively trying to keep it viable. In "Etudes Tsiganes" , a biannual revue "Musiques!" in 1994 had an excellent article entitled "Les Tsiganes, le musette, la guitare and le banjo" by Didier Roussin, where he covered this history and relationship between strings and reeds pretty thoroughly, from the earliest days through the release of "Paris-Musette". In "Django Reinhardt" by Antoinetto and Billard, there are chapters titled "Valses pour Django", "Django, la valse et la banjo", and two or three other chapters that cover this period in detail. I'm pretty sure that these chapters were originally published in "Etudes Tsiganes" as well. The 1994 revue mentioned earlier contains an enormous amount of information on various kinds of tsigane music - flamenco, eastern violin music/orchestres tsiganes, and jazz manouche are all covered in detail. As far as Django's own influences, I certainly believe that as was noted earlier, his use of arpeggios, and fast triplet and chromatic runs were all things he learned from the accordionists and not the other way around. No criticism there - the best proof of all this is simply to listen to Django and listen to accordion players from 1924 to 1928. The relationship is beyond obvious. A Richard Galliano and Birili Lagrene CD from the early 90s called "Viaggio" is really incredible - great playing by Galliano, terrific compositions, and Birili never played better before or since... It's on Spotify, check out Birili's solo on "Waltz for Nicky", it's unbelievable how perfectly he nails it. When listening to early Django there's a definite flavor of right hand tenor banjo technique executed on an almost super human level. Also horn stabs from the L. Armstrong influence I would guess......but who knows, seems he was a melting pot of everything he liked, think about the level of players that whole bunch was......listening to those old recordings is crazy! can fretwear or anyone elaborate on what "right hand tenor banjo technique" is, or how it is audibly identifiable ? I know nothing of banjo playing. 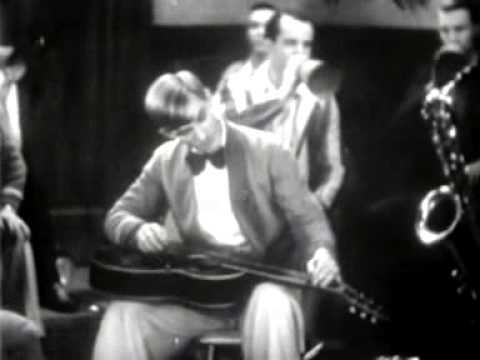 This is Eddie Peabody from 1929, playing textbook strumming banjo with all it's fast and accurate tremelos and melodic chording. This clip is kind of long at 11+ minutes, but starting at around 7 minutes he plays some variations on "Blue Skies" that are really amazing and show ideas similar to Django's though it's impossible that he'd heard of Django in 1929. Eddie Peabody was just an amazing musician and a wacky guy and for some reason is mostly forgotten today. Also check out "Strum Fun" where he plays a vaudeville version of "Some of These Days" easily as extravagant as anything Django ever played. Wow, thanks Scot. Never heard of him which is weird because I really like all that old jazz.